The 2016 Chevrolet Camaro SS is an incredible performer, but with the LT1 currently being the most powerful engine option in the new GM muscle car, owners will need some help from the aftermarket to keep up with the Dodge Challenger SRT Hellcat. Since the Hellcat Challenger was introduced with the 707hp supercharged Hemi, it has become the muscle car to which all other muscle cars are compared. A well-driven Hellcat Challenger will run well into the 10-second quarter mile range along with tickling the 200 mile per hour barrier on a long run – something which no other stock muscle car has been able to do. 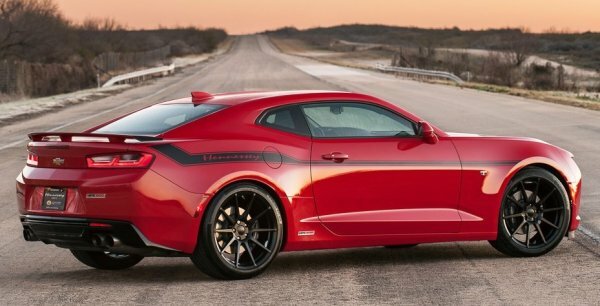 In stock form the 2016 Chevrolet Camaro SS can’t compete with those Hellcat numbers, but with the Hennessey Performance HPE750 package, the new Camaro can comfortably lay down numbers that will give owners a very good chance of outrunning the Hellcat in a short dash or a long run. The Hennessey HPE750 package for the 2016 Chevrolet Camaro SS adds a TVS2300 supercharger, a set of stainless steel headers, a stainless steel exhaust system, high flow catalytic converters and a new camshaft, but the key to this build is the cylinder heads. The stock LT1 heads are replaced by a set which have been heavily worked, with enlarged ports, a high performance valve job, lightweight hollow stemmed valves, titanium retainers, high strength valve springs, high strength pushrods and stronger lifters. Basically, the cylinder heads have been optimized in every way to offer the best performance possible, and when coupled with the supercharger’s 7 pounds of boost – the engine output rises to 751 horsepower and 643lb-ft of torque at the transmission. The Hennessey HPE750 package gives the 2016 Camaro SS ad advantage in horsepower, although the Hemi still packs more torque. Fortunately, the Camaro weighs far less, so when fitted with a set of sticky drag radial tires, the HPE750 Camaro will storm down the quarter mile in just 10.7 seconds. That puts this Camaro among the quicker of the stock-power Hellcat Challengers with drag radials on the drag strip, while Hennessey’s official top speed of 202 miles per hour will allow the HPE750 Camaro to best the Hellcat’s official top speed of 199 miles per hour. To show that their top speed claim was legitimate, the Hennessey team made a video showing the HPE750 Camaro making its record-setting run and you can find that video below. We get to see the run from a variety of camera angles in the car, on the car and from the side of the track, giving us a chance to hear the supercharged Camaro roar as it attacked the 200mph barrier. Now, I have to point out that comparing a heavily modified 2016 Camaro SS from Hennessey to the stock Hellcat Challenger is like comparing apples to oranges. A well-driven Hellcat Challenger with sticky tires and a good driver can run well into the mid-10s and I believe that at some point, Chevrolet will roll out a stock package for the Camaro that will compete right off of the showroom floor. However, until that day comes, Hennessey Performance can convert your 6th gen Camaro SS into a proper Hellcat hunter for the drag strip or the salt flats.